Creating affordable housing and building strong communities is complex work. We're here to help. 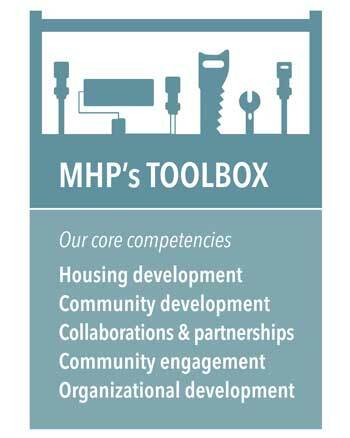 MHP provides the resources and knowledge you need to create and preserve housing and community assets. Our community development team has more than 140 years of combined experience working directly with communities, regions and organizations to achieve their housing and community development goals. From innovative community planning practices to knowledge of complex federal programs, our expertise helps to create effective — and lasting — collaboration among community leaders. MHP increases YOUR capacity to meet the current and future needs of your community. We help you build the local knowledge and leadership to attract and utilize resources to address your own challenges, so you're positioned to envision and achieve your goals long after your work with MHP. MHP has expertise in single and multi-family housing, as well as special needs projects, including supportive, transitional, and culturally relevant/appropriate housing. We’re also a national leader in navigating and complying with federal grants and programs. From regional dialogue to community planning, we’re experts in convening stakeholders and facilitating effective community engagement processes. MHP has created proven models — like our Housing Institute and our Native Community Development Institute — that teach diverse stakeholders how to collaborate on current and future community development projects. Creating a vibrant communities includes a wealth of different assets, from public spaces to social enterprises. We can help you envision and achieve your goals — and often identify or provide loan or grant support, as well. Achieving community goals requires strong local leadership. We can help develop your capacity with board training, strategic planning, staff development, program design and administration, funding applications, grant management and more. At MHP, we practice what we preach, collaborating with partner organizations when projects require knowledge outside of our in-house toolbox. Over the years, MHP has cultivated a rich network of partners to connect you to the assistance you need. To learn more, please contact Kelly Zelenka, Community Development Director, or call 651.925.5542. Housing Institute participants: Click here to log in and access Housing Institute materials!